Ballarat strapper Steven Payne’s Melbourne Cup dream has finally come true, and he has his sister to thank. 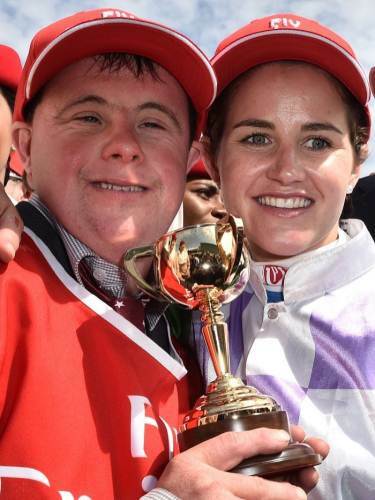 Michelle Payne yesturday became the first female jockey to claim the Cup when she rode rank outsider Prince of Penzance to victory ahead of Max Dynamite and Criterion. Steven was jubilant in the mounting yard as he summed up his sister’s efforts shortly after the race, saying of the ride “10 out of 10”. It is the strapper’s first time working on the biggest day in Australian racing, and he now has a perfect record to show for himself. The strapper, who has Down syndrome, was responsible for drawing Prince of Penzance’s number one barrier, and correctly predicted the horse would be “in front at 200 metres [to go]”. “It was a dream come through to pick barrier one. [I’m] so excited that I could get the job done for him today,” Michelle said of “Stevie” during her victory speech.